Product Inertia Creep: What it Is and How to Avoid It! In the world of endpoint and gateway security, product inertia creep is a dangerous force. But what exactly do we mean by that term? As you might imagine, we talk a lot amongst ourselves here about how we can help companies to implement the products and strategies that are best for their particular scenario. But the fact of the matter remains that in many cases, we see many clients and other mid-sized businesses giving into what we call product inertia and sticking with a product that is becoming increasingly inferior with each passing year. Product inertia doesn’t solve problems; only solving problems does. Perhaps it might help us to revisit Newton’s First Law of Physics which first introduced the concept of inertia, meaning the resistance of a physical object to any change in its state of motion. Inertia manifests itself behaviorally in our daily lives in the forms of complacency, laziness, or being resistant to change for no better reason than simply not wanting to try something different or change. And what kind of products are most prone to encouraging inertia in a consumer? Cars are a perfect example because they are products that we inherently take for granted as we become so dependent on their ability to seemingly take us anywhere. As every parent has told his or her teenager, cars require constant maintenance and awareness on the part of the driver to spot an odd sound or behavior, lest that young driver being left stranded on the side of the road after failing to schedule a tune-up. Product inertia provides young drivers with a false sense of security in that their car gets them to school every day, so why worry about getting it checked up if nothing seems wrong? As most of us eventually learn, cars are extraordinarily complex machines that, like the human body or a computer network, only takes one little thing to go wrong to set off a catastrophic chain reaction. And while most of us learn the dangers of product inertia as it relates to cars, often the hard way, and take our automobile in for regular tune-ups to lessen the chances of an eventual issue as the car gets older, there are always those who “will deal with it next week.” Their car might be covered in salt from the winter still and a noxious fume is coming out of the tailpipe, but don’t worry, they’ll get to it “any day now.” This is what what we call the product inertia creep as product inertia crept up from periodic to ongoing procrastination. Unlike a car however, product inertia as it relates to IT can have much more disastrous consequences. Endpoint security is one of, if not the most pressing concerns currently in the world of IT infrastructure, which makes productive inertia all the more of an insidious and destructive force. 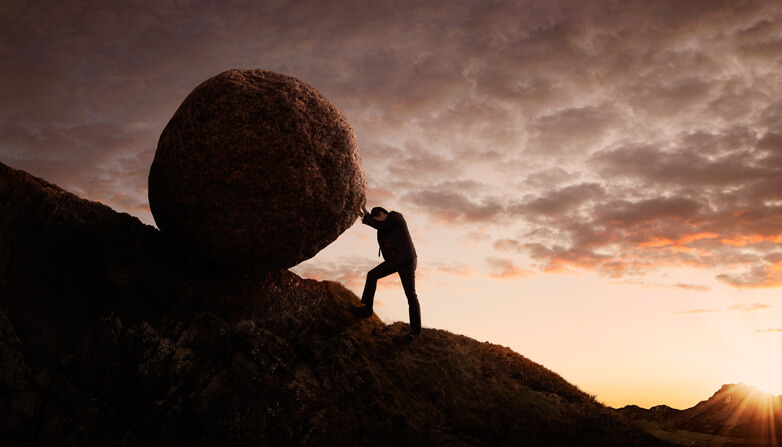 If you’re running McAfee’s endpoint protection or SonicWall asa your next-gen firewall solution, chances are that you’re experiencing product inertia right this moment. For the mid-sized business, a number of newer players have emerged amongst vendors over the past several years that have signaled something of a paradigm shift. As next-gen endpoint security and firewalls continue to become more advanced, endpoint security is starting to encompass more and more of a company’s security infrastructure. Additionally, the way we think about viruses is changing with companies like MalwareBytes and Sophos employing machine learning to identify patterns of attacks before they even threaten your network, as exemplified by Sophos’ anti-ransomware add-on Intercept X. Meanwhile, McAfee and SonicWall have been experiencing a great deal of inertia in their R&D following acquisitions by Intel and Dell, respectively. When you take a product like Sophos Endpoint Security, which features Synchronized Security, you’re enabling a heartbeat-like connection between your firewall and endpoint so that the firewall can alert the endpoint instantaneously of any potential threats. If you’re running McAfee and/or SonicWall, then you’re allowing a chasm to open up between those two points of protection, which hackers can much more easily exploit. Endpoint security has gone from a reactive model relying on traditional virus definitions to a proactive one designed to identify and stop the ever-changing methods of attack. Now, we can talk about the products we think you should be using until we’re blue in the face. At the end of the day, if what’s working for you is working, why take on the extra stress and cost of changing your endpoint or firewall for Sophos or Kaspersky? Much like that first time your car gives out due to product inertia, more IT admins than we’d like to see don’t learn that they need to update their firewall and endpoint security until something serious happens. This type of reasoning is emblematic of a traditional and more reactive school of thought that sees viruses as something to be identified and stopped once they hit your network. But as we were reminded just a couple weeks back courtesy of the ransomware WannaCry, there are no “safe” industries or companies anymore. Malware is constantly evolving to exploit reactive security systems as they are much easier to take down than a proactive one powered by Sophos’ Synchronized Security. Of course, we can’t force IT managers or the C-Suite to do the thing that may be best for them because ultimately the one way to break the creep of product inertia is to either learn the hard way or the much harder way. Firstly, no matter how smoothly the ship is currently sailing regarding your network security, in an ever-changing digital environment going a hundred days without an attack and assuming one is safe because of it is just not acceptable. The variety and sheer number of threats has reached a volume where a proactive, machine learning-enabled product like Sophos’ endpoint security is necessary to stay ahead of attacks. Lastly, the endpoint security market is changing faster than ever and it is now possible to do more with less, so to speak. Best-of-breed products like Sophos Central can integrate virtually their entire slate of product offerings into one centralized console that is easy to use while giving you unprecedented levels of access. Meanwhile, if you’re relying on two different vendors to ensure that your firewall and endpoint are in contact, your chances of weathering an attack are significantly diminished.So if you have even the faintest sense that maybe, just maybe you could be doing more with your firewall and endpoint security, schedule a security assessment with us today so we can help advise you on the solutions that make the most sense and provide the best value for your business. Do You Have Product Inertia? 1. Are you running next-gen firewall and endpoint security products? 2. Can you update your Firewall and access your Endpoint via the web? 3. Do you have adequate visibility? 4. Can you you deploy and update policies with flexibility? 5. Have you looked into other products besides what you currently have in the past three years? If you answered Yes to 2 or more of the above questions, you might have product inertia. Ask us any anything and we’ll get back to you!